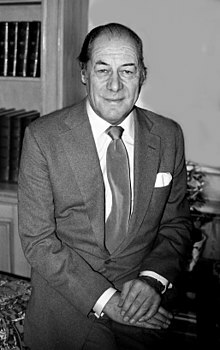 Sir Reginald Carey Harrison (5 March 1908 – 2 June 1990), known as Rex Harrison, was an English actor of stage and screen. Harrison began his career on the stage in 1924. He won his first Tony Award for his performance as Henry VIII in the play Anne of the Thousand Days in 1949. He won his second Tony for the role of Professor Henry Higgins in the stage production of My Fair Lady in 1957. He reprised the role for the 1964 film version, which earned him both a Golden Globe Award and Academy Award for Best Actor. In addition to his stage career, Harrison also appeared in numerous films, including Anna and the King of Siam (1946), The Ghost and Mrs. Muir (1947), Cleopatra (1963), and played the title role of the English doctor who talks to animals, Doctor Dolittle (1967). In July 1989, Harrison was knighted by Queen Elizabeth II. In 1975, Harrison released his first autobiography. His second, A Damned Serious Business: My Life in Comedy, was published posthumously in 1991. Harrison was married six times and had two sons: Noel and Carey Harrison. He continued working in stage productions until shortly before his death from pancreatic cancer in June 1990 at the age of 82. Harrison was born at Derry House in Huyton, Lancashire, the son of Edith Mary (née Carey) and William Reginald Harrison, a cotton broker. He was educated at Liverpool College. After a bout of childhood measles, Harrison lost most of the sight in his left eye, which on one occasion caused some on-stage difficulty. He first appeared on the stage in 1924 in Liverpool. Harrison's acting career was interrupted during World War II while serving in the Royal Air Force, reaching the rank of Flight Lieutenant. He acted in various stage productions until 11 May 1990. He acted in the West End of London when he was young, appearing in the Terence Rattigan play French Without Tears, which proved to be his breakthrough role. He alternated appearances in London and New York in such plays as Bell, Book and Candle (1950), Venus Observed, The Cocktail Party, The Kingfisher and The Love of Four Colonels, which he also directed. He won his first Tony Award for his appearance at the Shubert Theatre as Henry VIII in Maxwell Anderson's play Anne of the Thousand Days and international superstardom (and a second Tony) for his portrayal of Henry Higgins in the musical My Fair Lady, where he appeared opposite Julie Andrews. Later appearances included Pirandello's Henry IV, a 1984 appearance at the Haymarket Theatre with Claudette Colbert in Frederick Lonsdale's Aren't We All?, and one on Broadway at the Brooks Atkinson Theatre presented by Douglas Urbanski, at the Haymarket in J. M. Barrie's The Admirable Crichton with Edward Fox. He returned as Henry Higgins in the revival of My Fair Lady directed by Patrick Garland in 1981, cementing his association with the plays of George Bernard Shaw, which included a Tony nominated performance as Shotover in Heartbreak House, Julius Caesar in Caesar and Cleopatra, and General Burgoyne in a Los Angeles production of The Devil's Disciple. Harrison's film debut was in The Great Game (1930), other notable early films include The Citadel (1938), Night Train to Munich (1940), Major Barbara (1941), Blithe Spirit (1945), Anna and the King of Siam (1946), The Ghost and Mrs. Muir (1947), and The Foxes of Harrow (1947). He was best known for his portrayal of Professor Henry Higgins in the 1964 film version of My Fair Lady, based on the eponymous Broadway production (which in turn was based on George Bernard Shaw's play Pygmalion), for which Harrison won a Best Actor Oscar. He also starred in 1967's Doctor Dolittle. At the height of his box office clout after the success of My Fair Lady, Harrison proved a domineering force during production, demanding auditions for prospective composers after musical playwright Leslie Bricusse was contracted and demanding to have his singing recorded live during shooting, only to agree to have it re-recorded in post-production. He also disrupted production with incidents with his wife, Rachel Roberts and deliberate misbehaviour, such as when he deliberately moved his yacht in front of cameras during shooting in St. Lucia and refused to move it out of sight due to contract disputes. Harrison was at one point temporarily replaced by Christopher Plummer, until he agreed to be more cooperative. He starred in the 1968 comedy The Honey Pot, a modern adaptation of Ben Jonson's play Volpone. Two of his co-stars, Maggie Smith and Cliff Robertson, were to become lifelong friends. Both spoke at his New York City memorial at the Little Church Around the Corner when Harrison died in 1990. 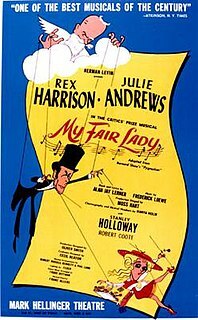 Harrison was not by any objective standards a singer (his talking on pitch style he used in My Fair Lady would be adopted by many other classically trained actors with limited vocal ranges); the music was usually written to allow for long periods of recitative, or "speaking to the music". Nevertheless, "Talk to the Animals", which Harrison performed in Doctor Dolittle, won the Academy Award for Best Original Song in 1967. Despite excelling in comedy (Noël Coward described him as "The best light comedy actor in the world—except for me. "), he attracted favourable notices in dramatic roles such as his portrayal of Julius Caesar in Cleopatra (1963) and as Pope Julius II in The Agony and the Ecstasy (1965), opposite Charlton Heston as Michelangelo. He also acted in a Hindi film Shalimar alongside Indian Bollywood star Dharmendra as well as appearing opposite Richard Burton as two ageing homosexuals in Staircase (1969). Harrison was married six times. In 1942, he divorced his first wife, Colette Thomas, and married actress Lilli Palmer the next year; they later appeared together in numerous plays and films, including The Four Poster. In 1947, while married to Palmer, Harrison began an affair with actress Carole Landis. Landis committed suicide in 1948 after spending the evening with Harrison. Harrison's involvement in the scandal by waiting several hours before calling a doctor and police briefly damaged his career and his contract with Fox was ended by mutual consent. Harrison and Palmer divorced in 1957. In 1957, Harrison married the actress Kay Kendall. Kendall died of myeloid leukaemia in 1959. Terence Rattigan's 1973 play In Praise of Love was written about the end of this marriage, and Harrison appeared in the New York production playing the character based on himself. Rattigan was said to be "intensely disappointed and frustrated" by Harrison's performance, as "Harrison refused to play the outwardly boorish parts of the character and instead played him as charming throughout, signalling to the audience from the start that he knew the truth about [the] illness." Critics however were quite pleased with the performance and although it did not have a long run, it was yet another of Harrison's well-plotted naturalistic performances. He was subsequently married to Welsh-born actress Rachel Roberts from 1962 to 1971. In 1980, despite his having married twice since their divorce, Roberts made a final attempt to win Harrison back, which proved to be futile; she committed suicide that same year. Harrison then married Elizabeth Rees-Williams, divorcing in 1975, and finally in 1978, Mercia Tinker, who would become his sixth and final wife. Harrison's eldest son Noel Harrison became an Olympic skier, singer and occasional actor; he toured in several productions including My Fair Lady in his father's award-winning role. Noel died suddenly of a heart attack on 19 October 2013 at age 79. Rex's younger son Carey Harrison is a playwright and social activist. Harrison's sister Sylvia was married to David Maxwell Fyfe, a lawyer, Conservative politician and judge who was successively the lead British prosecutor at Nuremberg, Home Secretary and Lord Chancellor (head of the English judiciary); after his death she married another Cabinet minister, Lord de la Warr. Harrison owned properties in London, New York City and Portofino, Italy. His villa in Portofino was named San Genesio after the patron saint of actors. Having retired from films after A Time to Die, Harrison continued to act on Broadway and the West End until the end of his life, despite suffering from glaucoma, painful teeth, and a failing memory. He was nominated for a third Tony Award in 1984 for his performance as Captain Shotover in the revival of George Bernard Shaw's Heartbreak House. He followed with two successful pairings with Claudette Colbert, The Kingfisher in 1985 and Aren't We All? in 1986. In 1989, he appeared with Edward Fox in The Admirable Crichton in London. In 1989/90, he appeared on Broadway in The Circle by W. Somerset Maugham, opposite Glynis Johns, Stewart Granger, and Roma Downey. The production opened at Duke University for a three-week run followed by performances in Baltimore and Boston before opening 14 November 1989 on Broadway. Harrison died from the effects of pancreatic cancer at his home in Manhattan, New York City, on 2 June 1990 at the age of 82. He had only been diagnosed with the disease a short time before. The stage production in which he was appearing at the time, The Circle, came to an end upon his death. His body was cremated, some of his ashes being subsequently scattered in Portofino, and the rest being scattered at his second wife Lilli Palmer's grave at Forest Lawn Memorial Park in Glendale, California, in the Commemoration section, Map 1, Lot 4066, Space 2. Harrison's second autobiography, A Damned Serious Business: My Life in Comedy (ISBN 0553073419), was published posthumously in 1991. On 25 July 1989, Harrison was knighted by Queen Elizabeth II at Buckingham Palace as an orchestra played the music of songs from My Fair Lady. Rex Harrison has two stars on the Hollywood Walk of Fame, one at 6906 Hollywood Boulevard for his contribution to films, and the other at 6380 Hollywood Boulevard for his contribution to television. Harrison is also a member of the American Theater Hall of Fame. He was inducted in 1979. Due to his association with the checked wool hat, which he wore both in the Broadway and film versions of My Fair Lady, the style of headware was often named "The Rex Harrison." Seth MacFarlane, creator of the animated series Family Guy, modelled the voice of the character Stewie Griffin after Harrison, after seeing him in the film adaptation of My Fair Lady. Night Train to Munich Gus Bennett / "Dickie Randall"
^ "Rex Harrison, a Leading Man With Urbane Wit, Dies at 82". The New York Times. Retrieved 5 February 2014. ^ "(Sir) Rex Harrison". filmreference.com. ^ "Sir Rex Harrison Biography at". Biography.com. Archived from the original on 17 July 2009. Retrieved 5 February 2014. ^ "The Love of Four Colonels". ibdb.com. Retrieved 1 October 2009. ^ Smith, J. Y. (3 June 1990). "Rex Harrison, 82, Dies; Star of 'My Fair Lady'". The Washington Post. pp. c. 07. ^ Mosby, Aline (6 July 1948). "Carole Landis Mystery Death Clues Hunted". Oakland Tribune. p. 1. ^ Pace, Eric (3 June 1990). "Rex Harrison, a Leading Man With Urbane Wit, Dies at 82". The New York Times. p. 2. Retrieved 12 May 2009. ^ Rich, Frank (21 November 1989). "Review/Theater; Rex Harrison Back on Broadway". The New York Times. Retrieved 12 May 2009. ^ York, New (29 June 1989). "Coming Full 'Circle'". Chicago Tribune. Retrieved 17 June 2012. ^ Treadwell, David (15 December 1989). "Column One : Culture in the South Rises Again". Los Angeles Times. Retrieved 17 June 2012. ^ Pace, Eric (3 June 1990). "Rex Harrison, a Leading Man With Urbane Wit, Dies at 82". The New York Times. p. 1. Retrieved 12 May 2009. ^ Johnston, Laurie (19 November 1979). "Theater Hall of Fame Enshrines 51 Artists" (PDF). The New York Times. ^ Franklin, Nancy (16 January 2006). "American Idiots". The New Yorker. ^ Kirby, Walter (13 April 1952). "Better Radio Programs for the Week". The Decatur Daily Review. p. 48. Retrieved 11 May 2015 – via Newspapers.com. ^ Kirby, Walter (30 March 1952). "Better Radio Programs for the Week". The Decatur Daily Review. p. 46. Retrieved 18 May 2015 – via Newspapers.com. ^ "Rex Harrison". Playbill Vault. Retrieved 21 November 2013. ^ Kirby, Walter (18 October 1953). "Better Radio Programs for the Week". The Decatur Daily Review. p. 48. Retrieved 6 July 2015 – via Newspapers.com. ^ Kirby, Walter (22 November 1953). "Better Radio Programs for the Week". The Decatur Daily Review. p. 46. Retrieved 8 July 2015 – via Newspapers.com. Donnelley, Paul (2003). Fade To Black: A Book Of Movie Obituaries (2nd ed.). Omnibus Press. ISBN 978-0-7119-9512-3. Fleming, E. J. (2004). The Fixers: Eddie Mannix, Howard Strickling, and The MGM Publicity Machine. McFarland. ISBN 978-0-7864-2027-8. Golden, Eve; Kendall, Kim Elizabeth (2002). The Brief, Madcap Life of Kay Kendall. University Press of Kentucky. ISBN 978-0-8131-2251-9. Hadleigh, Boze (2001). The Lavender Screen: The Gay and Lesbian Films – Their Stars, Directors, and Critics (3rd ed.). Citadel Press. ISBN 978-0-8065-2199-2. Harris, Mark (2008). Pictures at a Revolution: Five Movies and the Birth of the New Hollywood. Penguin Press. ISBN 978-0-143-11503-8. Harrison, Rex (1975). Rex: An Autobiography. William Morrow. ISBN 978-0-688-02881-7. Parish, James Robert (2007). The Hollywood Book of Extravagance: The Totally Infamous, Mostly Disastrous, and Always Compelling Excesses of America's Film and TV Idols. John Wiley and Sons. ISBN 978-0-470-05205-1. Wapshott, Nicholas (1991). Rex Harrison: A Biography (1st ed.). Chatto & Windus. ISBN 978-0-701-13764-9. Wikimedia Commons has media related to Rex Harrison. Rachel Roberts was a Welsh actress. She is best remembered for her forthright screen performances as the older mistress of the central male character in two key films of the 1960s, Saturday Night and Sunday Morning (1960) and This Sporting Life (1963). For both films, she won the BAFTA Award for Best British Actress. She was also nominated for the Academy Award for Best Actress for This Sporting Life. Her other notable film appearances included Murder on the Orient Express (1974), Picnic at Hanging Rock (1975) and Yanks (1979). Edward Macdonald Carey was an American actor, best known for his role as the patriarch Dr. Tom Horton on NBC's soap opera Days of Our Lives. For almost three decades, he was the show's central cast member. 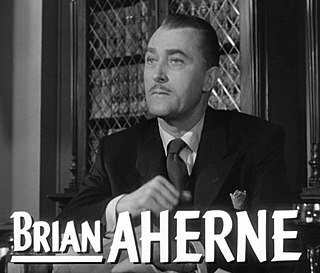 William Brian de Lacy Aherne was an English actor of stage, screen, radio and television, who enjoyed a long and varied career in England and America. Lilli Palmer was a German actress and writer. After beginning her career in British films in the 1930s, she would later transition to major Hollywood productions, earning a Golden Globe Award nomination for her performance in But Not for Me (1959). Frank Andrew Lovejoy Jr. was an American actor in radio, film, and television. He is perhaps best remembered for appearing in the film noir The Hitch-Hiker and for starring in the radio drama Night Beat. Alexander Sheriff de Moro "Alec" Clunes was an English actor and theatrical manager. John Lund was an American film actor who is probably best remembered for his role in the film A Foreign Affair (1948), directed by Billy Wilder, and a dual role in Mitchell Leisen's To Each His Own (1946). Kurt Kasznar was an Austrian-American stage, film, and television actor who played roles on Broadway, appearing in the original productions of Waiting for Godot, The Sound of Music and Barefoot in the Park and had many notable parts in television and feature films. William Henry Mettam "Robin" Bailey was an English actor. He was born in Hucknall, Nottinghamshire. George Walter Rose was an English actor and singer in theatre and film. Michael Allinson was a British-American stage and film actor. Lady in the Dark is a 1944 American Technicolor musical film directed by Mitchell Leisen and starring Ginger Rogers. It was nominated for three Academy Awards; for Best Cinematography, Best Music and Best Art Direction.